Kelvin Thomas has confirmed the club has ‘received a lot of applications’ for the manager’s job at the Cobblers. The Town chairman has already stated he is going to take his time to ensure he gets the right man for the job. Thomas revealed last week that he had already spoken to at least four potential candidates, with Chris Wilder quitting the Northampton job to take over at Sheffield United, but that he was also going to wait and see who applied for the post and go about things in ‘a professional manner’. Four days after Wilder’s departure was confirmed, Thomas has told the Chron ‘we have received a lot of applications’, and he and his fellow decision makers are ‘beginning to speak to to people about the job’. Several candidates have been linked to the post, with the bookies’ favourite still former Blackburn Rovers boss Gary Bowyer, but Port Vale boss Rob Page has also been heavily backed. The former Wales international guided Vale to a respectable 12th­-placed finish in Sky Bet League On this season, but told the Stoke Sentinel newspaper that he has had ‘no contact’ with the Cobblers. Page has been given a ringing endorsement by one of his players though, with Vale midfielder Anthony Grant admitting he is ‘not surprised’ Page is being linked with other jobs. 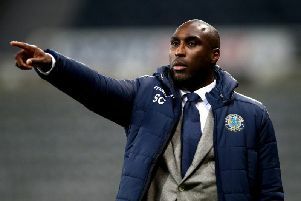 Page has also been mentioned in connection with the Cardiff City top job and also, before Wilder’s appointment, with the Sheffield United manager’s post, with the former central defender having spent three years at Bramall Lane as a player. “It’s no surprise he’s being linked to other jobs. He’s done very well with a limited budget,” said Grant. Also still high in the bookies’ lists are likes of Steve Cotterill, Andy Scott, Neal Ardley, Paul Tisdale and Darren Ferguson, while Nigel Adkins, who lost his job at Sheffield United last week so they could employ Wilder, is 20/1 for a job swap.